Meat inspection, meat hygiene and official control tasks in the slaughterhouse have always been of major importance in the meat industry, and are intimately related with animal diseases and animal welfare. The history of meat inspection has largely been a success story. Huge steps have been taken over more than a century to prevent the transmission of pathogenic organisms and contagious diseases from animals to humans. Various factors influence the quality and safety of meat including public health hazards (zoonotic pathogens, chemical substances and veterinary drugs), animal health and welfare issues during transport and slaughter. Meat inspection is one of the most important programs in improving food safety, and its scope has enlarged considerably over the last decades. Globalization has affected the complexity of the modern meat chain and has provided possibilities for food fraud and unfair competition. During the last two decades many food fraud cases have been reported, which have caused concern among consumers and the industry. Subsequently meat inspection is faced with new challenges. 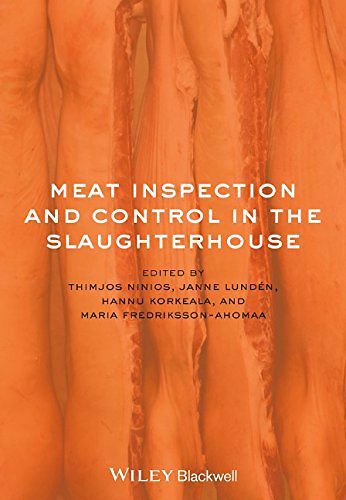 Meat Inspection and Control in the Slaughterhouse is an up-to-date reference book that responds to these changes and reflects the continued importance of meat inspection for the food industry. 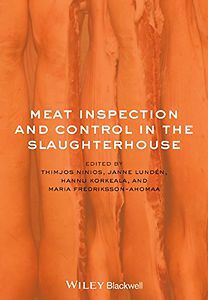 The contributors to this book are all international experts in the areas of meat inspection and the official controls limited to slaughterhouses, providing a rare insight into the international meat trade. This book will be of importance to students, professionals and members of the research community worldwide who aim to improve standards of meat inspection procedures and food safety.